There's a long tradition of storytelling and theater in technology companies. You might be surprised to hear this, because a lot of people think of tech as mostly nerds and bros doing nerdy bro things. But tech companies aren't shy about talking of changing the world, making a difference, and so on, in addition to selling widgets or serving up websites. If you think your work is important - and it might well be - then you spend time in your companies telling stories to each other and to the world. And if you doubt the importance of storytelling by companies to their customers, may I refer you to the latest Apple keynote. This keynote hasn't actually happened yet, but I know it'll be superb theater - sure, they'll be talking about world-class innovative engineering and design, but it's presented on a stage in a master storytelling fashion, complete with drama, humor, pathos, and tension. 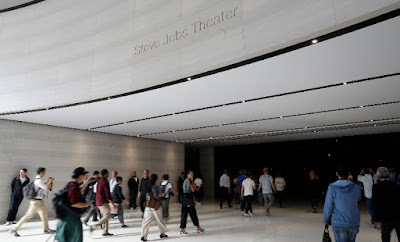 It's no accident that Apple spent $179 million dollars on its new theater, and then named it after Steve Jobs, the greatest storyteller in tech history. There are many ways to tell stories: in writing, in small groups, from a stage. These ways further subdivide: you tell a story differently in a blog post than you do in a tweetstorm. There are different techniques for a solo stage show than for telling a story to your friend over coffee. I've become acutely aware of these differences lately. I'm blessed and cursed with a compulsion to tell stories, as my long-suffering friends are all too aware. It's not enough for me to experience something interesting, unusual, or funny - I have to tell other people about it or it feels incomplete. I'm a writer, so I usually share things by writing them down in my blog, or on Facebook or Twitter. But recently I thought it might be interesting to tell my stories from a stage as a solo show. I've been working on this for awhile, and very soon I'm going to get up onstage at The Marsh in San Francisco and try it out. From a stage, I have to be bigger and bolder than when I'm just "performing" for a few friends. I have to add characters, really live scenes instead of just describing them. Because I've mainly been a writer, this is new for me. It feels uncomfortable and I'm sure I'm doing a million things wrong. But I'm compelled to get up there and tell stories this way. I hope eventually it's entertaining - even if it never changes the world. Come see me at Monday Night Marsh in San Francisco on June 11th and 25th. Thanks to Keith Rollin and Dave Mark for photo search support.